Yup: I have a finish. I actually finished it yesterday but couldn't get a decent photo. I still can't..it is stitched on a lovely creamy fabric which I just can't get the camera to show..and the tails can be seen quite happily by eye, just not in the picture. I think it is my camera but can't find my old one anywhere so I guess you will have to take my word for it! January the First...and the first finish and first new release for 2014! Poor Holmsey Hare was trying to teach Fergus about Valentine's day in a manner fitting to reflect love and respect between friends. As always, Fergus got a little carried away and over-enthusiastic. He just grabbed the largest rose he could! It is nearly bigger than Holmsey! Holmsey sighs and reminds himself it is the thought that counts as he presents his sensible but pretty pink rosebud. 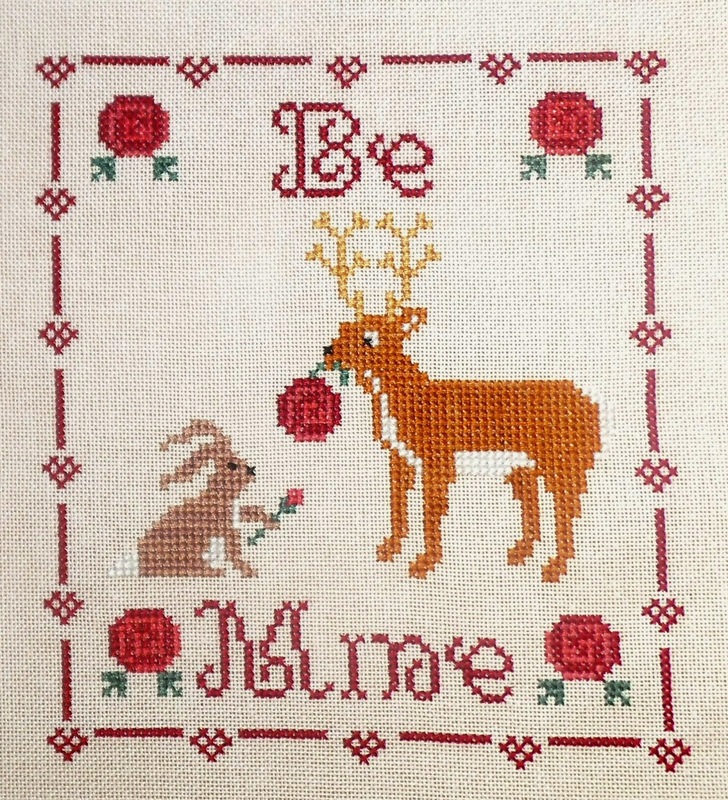 Stitched on cream Brittney using threads from The Victorian Motto Sampler Shoppe threads (with DMC conversions on the chart instructions). 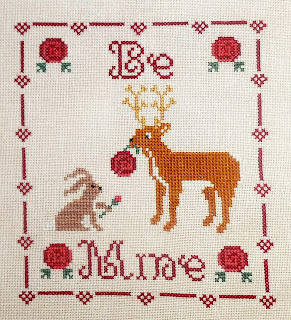 Size = 79 x 89 stitches. Charts will be on sale from next week. To be put into a draw to win a free pdf chart just leave a comment at the bottom of this post and share! I will make the draw next week. Good Luck and a very happy new year! I would love a chance to win please! Ohh isnt Holmsey cute!!! Gorgeous chart. I'm loving Holmsey and Fergus - hope they show up often this year! What a cute pattern! Your finish is great! I love the stories that go along with your patterns. Do you include them with the pattern. If someone were to stitch them up maybe they could print out the story and put it on the back or if they framed it they could do the same thing. Just a thought. Do not include me in this draw as I have enough planned for 2014. Plus I am taking part in the Stitch from Stash this year. I am going to work hard at this one! Wising you a wonderful weekend! Love your designs! They are so cute. You could write a book - the Adventures of Holmsey and Fergus :) The stories really add a lovely touch to your designs! I love the font that you chose for this pattern...very elegant. Take care! This is adorable Gaynor!! Great first finish of 2014!! I love the colours in this design! Oh, how adorable!! I love it even more after reading the story!! An other cute creation beautifully stitched! Gaynor, I love this and the back story is lovely. I could have swore I had already entered your giveaway, but don't see my comment, so here goes again. Thank you for the opportunity to win one of your charts.